Windows Live Writer Stopped Support For Blogger "Permanently"! Sad but true! Blogger users will no longer be able to publish blog posts using Windows Live Writer. UPDATE: Open Live Writer Connection Error has been fixed. Read how to fix the blogger login errors and other formatting issues. Microsoft has finally stopped support for its Blog-Publishing tool Windows Live Writer but fortunately it was kind enough to Open-Source the project by allowing the online community to continue its development. On 9th Dec, 2015, Microsoft's employee, "Scott Hanselman" announced that some engineers within Microsoft has successfully open sourced and forked Windows Live Writer and gave it a new name entitled as Open Live Writer (aka OLW) and it is now part of the .NET Foundation and managed by this group of independent volunteers from Microsoft. 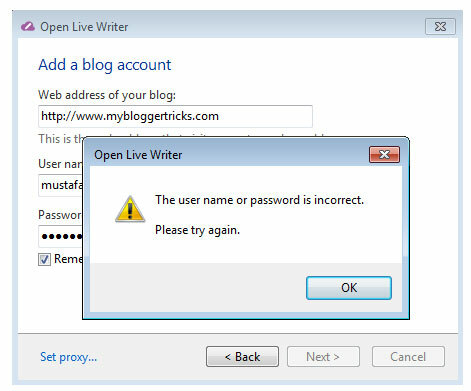 Windows Live Writer will continue working but due to no future updates since 2012 it has shut down its support for Blogger blogs permanently due to Google's modern OAuth 2 authentication system. Scott said it in clear words that WLW will never support this new OAuth 2 authentication system, so if you are a Blogger.com user, you'll have no choice but to switch to Open Live Writer. WLW will no longer work with blogspot blogs but it will continue working with WordPress and other blogging platforms. None of our Forum Tricks for fixing the 2 step authentication will work now. 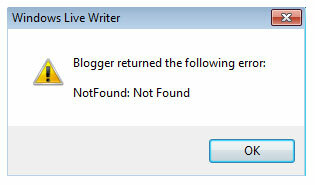 Windows Live Writer will return the error "NotFound: Not Found" for Blogger Blogs from now onwards and there is currently no solution or fix for this bug and there will never be one as per the Microsoft employee: Scott Hanselman. Unfortunately currently even "Open Live Writer" uses the old authentication endpoint and does not support connection to Blogger accounts. OLW throws an error "The username or password is incorrect. Please try again". The following error is shown when you try to connect your blogspot blog with OLW. Google runs the excellent Blogger blog service. We've worked with the Blogger Team within Google on this project, and they've been kind enough to keep an older authentication endpoint running for many months while we work on Open Live Writer. Soon, Google and Blogger will finally shut down this older authentication system. Blogger will use the more modern OAuth 2 and Open Live Writer will be updated to support OAuth 2. This means if you use Windows Live Writer and would like to keep using it to post on Blogger, you will need to migrate to Open Live Writer since Windows Live Writer will not ever support our new authentication system. However, we would like to warn you the connection between the Blogger and Open Live Writer might not work for a while. Open Live Writer is surely the next big blog editor that will allow you to create blog posts, add photos and videos then publish to your website. You can also compose blogs posts offline and then publish on your return just like you did using WLW. Open Live Writer works with many popular blog service providers that were previously supported by WLW. Platforms include WordPress, SharePoint, Blogger, TypePad, Moveable Type, DasBlog and many more. Note: Blogspot accounts are currently facing authentication issues and OLW team has promised to fix this issue as soon as possible through a github thread. I will keep you updated with all latest developments. Scott made it quite clear that OLW is an open source project under the .NET Foundation and is managed and coded by volunteers. Although Open Live Writer may look like an exact clone of WLW but it is not a Microsoft product. Some of the volunteers work for Microsoft and are doing this work in their spare time. You must not delete WLW, Open Live Writer installation will not override your WLW files. They both will act as different tools in your Windows PC. I wrote this blogger post offline using Windows Live Writer and I simply copied the Source HTML and pasted inside blogger editor to publish the blog post. So you can continue using WLW to format your posts. OLW currently have no Spell Check support for Windows 7 so if you are a Win7 user, WLW could still prove a lot useful to write quality posts offline with no grammatical mistakes. really bad news especially for blogspot developer, before the WLW going shutting down...we could easily publish 20 to 25 posts on demo sites when new template has created. but now have to look to alternate method. For Demo sites you can still simply export a demo site and import it on another to publish all posts at once. That is another way to do it. But yes WLW had its on fun but OPEN LIVE WRITER is the same WLW with just another name. HI, Mohammad, thanks for your rely, however, i would like to continuos my discussion that you advised me to export demo site and import in another, i did the same earlier but after importing the site...then after 5 minutes blogger deleted the site where i imported the other demo site. I tried alot with even different account but they delete that blog. SO any solution for that...? Thanks for this post. I'm not techno savvy and I have been scratching my heads those last few days as I was unable to post from WLW. I guess I'll go with the good old copy and past. Pretty right caroline. Using WLW as backup is surely a nice idea. People who deleted it are now lost on how to post during these holidays so you are lucky you still have the old copy. When you'll set up the blog account, we have to choose "Google Blogger" option and not "Other services" as we used to do with Windows Live Writer. Despite, you have to be connected to Blogger in your default browser for the first authentification. Still the password incorrect error. The only thing that I want to use the Writer instead of the Blogger new post page is lack of various and basic formatting options like creating tables and boxes. Hope, I will be able to log in in next update. Thanks for this post. Using this OLW i am not able to type or edit. when I am retriving the page it shows only theme back ground. post body not showing. Kindly guide me how to do. Hi, using OLW when 'm writing a post in any selected font like Century Gothic or Arial, after publishing it got changed in webpage. Help Sir. I'm no techy, as you'll soon read, so I'm really stuck. What will happen to my posts created in WLW? I can see them in WLW, but I can't make edits to the posts (it shows the error messages you have shown above). So how does one go about working with these old posts?! Are they lost forever in cyberspace? If there's a way to edit them, please let me know. Also, are there any updates on OLW--how it's working with Blogger, any glitches, any suggestions? I managed to install and open OLW but still cannot enter WLW, same promblem with unknown password. So to write in WLW and copypaste the URL in OLW will not work.